I completed my field work and family interviews in March. As I prepare my final report for the family, allow me to share with you some observations, reflections, and photos. I stayed three nights and devoted three days to the tasks at hand. Never one to permit dawn to escape my notice, I captured early dawn (lower left) and later the sun’s first peek above the horizon (below right) on the first morning. 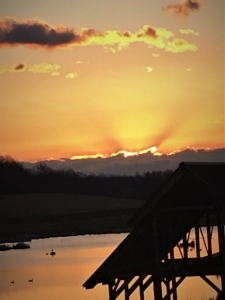 Crepuscular rays grace the upper right of the sunrise image. I snapped both photos from the lakeside cabin where I stayed, an extraordinary place to nest while “working” on such a professionally fulfilling project. Somehow, the word “work” implies something in the way of drudgery, challenge, and unpleasant effort. Nothing could be further from the truth. I found instead a high return in satisfaction and reward. Day two dawned with comparable glory, first early dawn and then sunrise. Who could ask for anything more. I’ll repeat a John Muir quote I applied just last week in my Post on lecturing at Bryn Athyn College. One hundred thirty years ago, Muir observed, When we contemplate the whole globe as one great dewdrop, striped and dotted with continents and islands, flying through space with other stars all singing and shining together as one, the whole universe appears as an infinite storm of beauty. Imagine 1.7 square miles of abused agricultural land further despoiled by strip-mining, and now rehabilitated to the point of this old forester seeing it representing an infinite storm of beauty! I would have depicted a third morning had it dawned with other than full overcast, blustery winds, and snow flurries. The two late afternoon views below, both from the residence patio, are to the north (left) and east (right), providing a good sense of the lay of the land. To the north, the property abuts adjoining land within a few hundred yards. 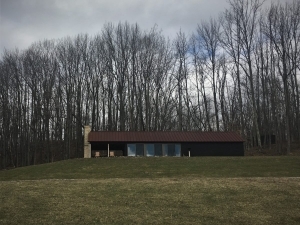 The property extends beyond the distant woods line to the east. Hard to imagine a 100-foot high-wall dropping away about where the fence row is now! 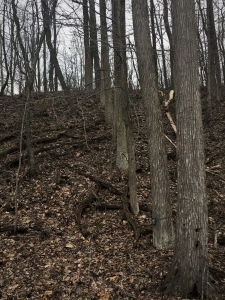 Just beyond that east side wooded ridge, the non-reclaimed, 50-foot high-wall (below left) reveals the harsh character of the stripping that once came within 100 feet of the residence. 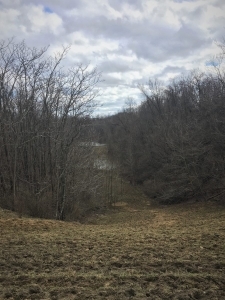 This high-wall predates even Ohio’s earliest reclamation regulations. Frankly, I am glad that it remains untouched. Without it, I would have no window into the sandstone, shale, mudstone, and occasional limestone strata underlying the original surface. Nor would I have some gauge on the pace of natural healing. The stripping stopped here because the overburden to coal seam thickness ratio exceeded an economic threshold. At some fifty years, the high-wall is collapsing into the cut basin. 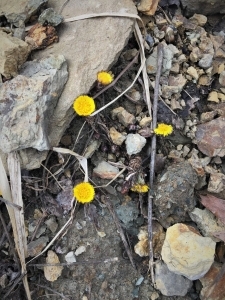 Coltsfoot (Tussilago farfara; lower right), among the region’s earliest spring ephemerals, is sending up a few blossoms, which precede its leaves by several weeks. By the end of March, the scree slopes would have been dressed in the gold of thousands of blooms. The high-wall and basin extending to the south is shallower and nearly grown over with advancing forest. Nature knows how to handle disturbance, whether natural or machine-induced. Imagine perhaps a few hundred years from now, when even a discerning forester would struggle to interpret the anthro-geomorphology that led to the then current landscape. Stripped in about 1960, the heap has healed remarkably well [An August note to myself: I need to find out from the current owner what if anything might have been done to revegetate or return topsoil. What did the 1947 regulations actually require?] 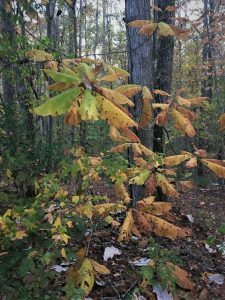 My quick circuit tallied 14 tree species: sweetgum; ash; red maple; silver maple; elm; red oak; sycamore; black cherry; hickory; walnut; hawthorn; black locust; American beech; yellow poplar. [Note — I found big tooth aspen in March, bringing the total to fifteen tree species.] Were any of these planted? 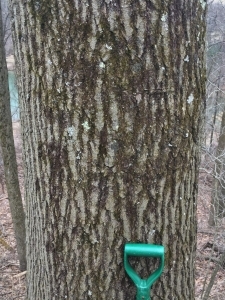 I cored a red oak and counted 58 annual rings, confirming the 1960 or so strip mine abandonment. I am astounded by tree species richness, stand density, and dominant tree heights. Granted, the stand is variable, ranging from excellent stocking to scattered individuals. Site quality also varies dramatically. Dominant tree height approaches 80 feet in places… 50 feet in others. All in all, however, I would not have anticipated the expressed level of recovery and rehabilitation. I exposed a surface soil profile near the summit. I struggled to dig even to eight inches. Coarse, sharply-fractured stone dominates the profile. The fragments are generally less than two inches, including far more fines than I had expected. The forest floor comprises a surprisingly thick organic layer and leaf litter. Roots are exploiting the entire profile. A distinct A-horizon suggests excellent soil development and organic matter incorporation. Soil formation is underway. The debris heap photo below is obviously from March during the dormant season, which from this angle I would never have guessed is anything but a natural forest on undisturbed soil. Without understory vegetation to limit my view into the forest at eye level, evidence of intentional revegetation leaped into view. How could I have missed the obvious last August? I found row after row of planted sweetgum (Liquidambar styraciflua) running vertically from bottom to top of the heap. I found no other species in rows. Interestingly, the natural range of sweetgum does not extend into east-central Ohio, growing naturally only in the very southern part of the state along the Ohio River. The landowner, a gentleman who is a student of his land (a scholar in many regards), had likewise not noticed the rows. From the debris heap summit, I found parallel planted rows lining the old access trail down the south hillside to the marsh just west of the cabin. 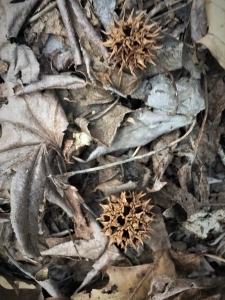 For those not familiar with sweetgum seed pods, see below right. The owner indicated that Hannah Coal had mined this particular site. He will determine what records might exist to tell us more about the tree planting plan and action. I have observed multiple times that every thing in Nature has a story to tell. Overlay the hand (and machines) of man and the stories multiply. Still at the debris heap, I found a 28-inch diameter (4.5 feet above the ground) red oak (below left) at the summit. What is its origin? 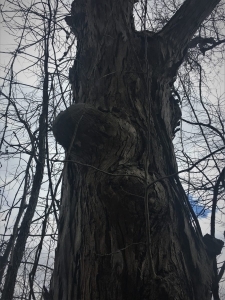 An acorn fortuitously cached by a squirrel at a spot where machinery had deposited an especially rich and thick dressing of topsoil during whatever reclamation transpired? 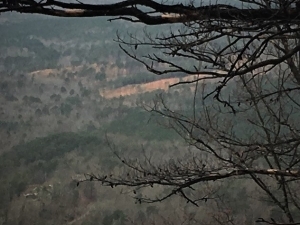 Perhaps the tree planting crew had been directed to plant only the sweetgum in straight rows on the steeper side-slopes, and randomly plant a mix of other species on the flatter summit. Maybe they planted the oak seedling in a spot where the dibble found deeper soil among the rocks in the debris pile. 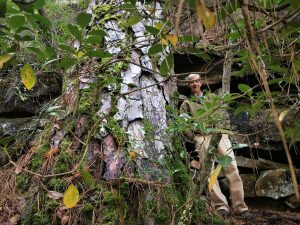 Sixty years ago as machinery stripped and then moved on leaving the debris heap, the now forty-inch diameter hickory (below right) stood witness at the southeast base of the heap, already at least half-a-century old. Why did operators not disturb it? Did it provide welcome shade for workers? Like the red oak and the planted sweetgum, the hickory has a story of human and natural actions. Again, Nature knows disturbance… and has evolved over eons the tools to persevere, recover, and flourish. 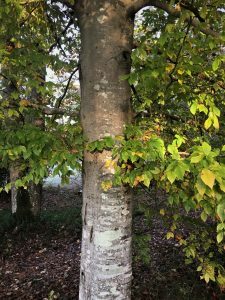 Five hundred years ago Leonardo Da Vinci observed, “Human subtlety will never devise an invention more beautiful, more simple or more direct than does nature because in her inventions nothing is lacking, and nothing is superfluous.” Nature knows disturbance! 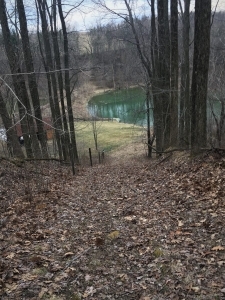 This wasted, scarred, and desecrated land is not at all what many would have presumed based upon its history of strip mining. 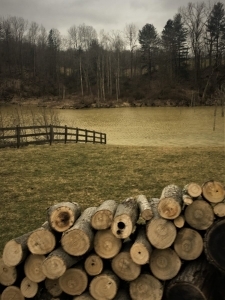 The pond and marsh (below) lie just west of the cabin. Everything within sight derived from stripping and some degree of reclamation. Firewood cut from regenerated forest warms the cabin and fuels the grill. 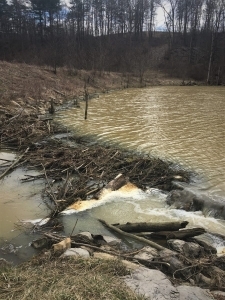 Beavers populate the property and their dam (lower right) supplements pool depth. The landowner permits trapping for family, friends, and acquaintances. 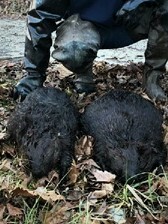 One such trapper a week before my March visit harvested these two beavers. Deer are abundant on the property. I often saw groups of 3-7 individuals. The family issues permission to hunt to selected friends and family. 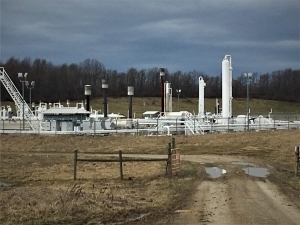 Dark afternoon clouds accent the gas well-pad mid-property. Gas lines, access roads, and worker movement and activity complicate cattle operations, yet the above and below ground operations are generally compatible. Cattle production stands as the primary commercial land use, yet I submit that the overall principal management tenet is Earth stewardship. 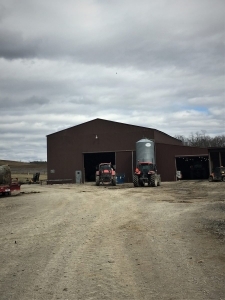 The equipment barn and cattle handling facility occupy the over-size utility building that served the strip mining company that the family owned prior to starting the current cattle business. 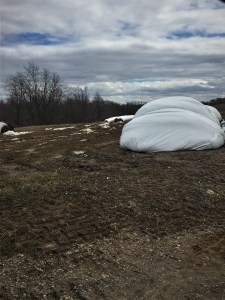 Haylage to hold the cattle until spring green-up lies encased in plastic below right. These cattle await their afternoon repast near the barn. I took this photo from the east, looking westward toward the cabin and the forest atop the debris heap. Do you see any evidence of strip mining? Had someone dropped me blindfolded at the lake’s eastern end, I would not have known. 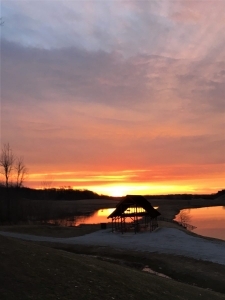 Yet the 17-acre lake is a strip mine product as is every other facet of the within-view landscape. This part of the property provides robust recreational escape for the family. The pavilion in the foreground of the sunrise photos served as the location for the wedding of one son. 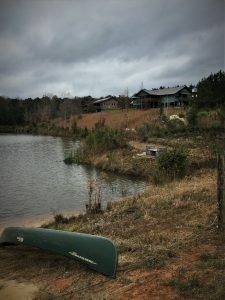 I relished my August 2018 and March 2019 nights at the cabin. As I accepted my bachelors of forestry degree in 1973, the US government was drafting and debating federal strip mine regulations and laws. The President signed the Surface Mining Control and Reclamation Act of 1977. 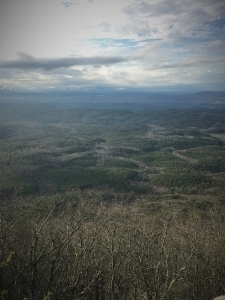 I celebrated because I had seen first-hand the scarred central Appalachians near my home in western Maryland. I had no idea that 46 years after graduation that I would be performing a Land Legacy evaluation on a property a hundred miles from my home, leading me to recognize that the line between devastation and remediation can be fuzzy. Unintended consequences aren’t always negative. That the initial strip mining devastation on this project property was more land salvation than ruin. Things aren’t always what they appear to be. 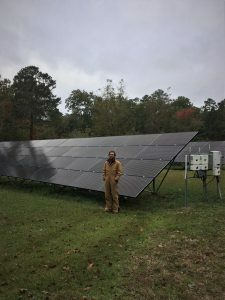 Our role as Earth stewards begins with recognition and embrace of obligation, carries through commitment to action, and results in generations-long pledges to retain and improve some small corner of the world through wisdom, knowledge, and hard work. I interviewed the owners and all four of their adult children. Without exception, the family sees this unit of Mother Earth as a legacy for many generations yet to come. I feel truly privileged and honored to help tell the tale of their love and devotion to the land and its future. The adventure at Malabar is by no means finished… The land came to us out of eternity and when the youngest of us associated with it dies, it will still be here. The best we can hope to do is to leave the mark of our fleeting existence upon it, to die knowing that we have changed a small corner of this earth for the better by wisdom, knowledge and hard work. 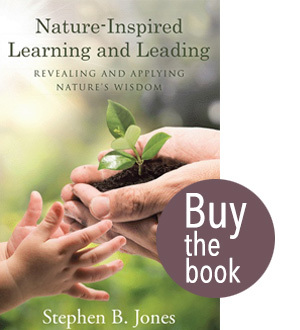 Nature knows disturbance — learn to harness her wisdom. Very few things are as they first appear. So much in Nature lies hidden within. Earth stewardship is a multi-generational commitment of passion and action. 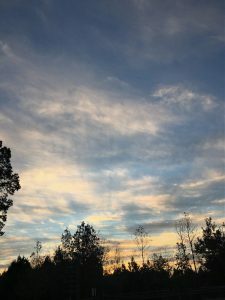 My purpose with this followup Post is to highlight some of the sky photos I captured while there. I never stop admiring the firmament (the sky or heavens — the vault of the sky). I also never cease to pause when using the term firmament! I remind myself that dry land (not sea or air) is terra firma. Both words employ firma. Odd that somehow one is land and the other sky. Yes, I examined the etymology for both terms. Yet I will forevermore remain uncertain at first blush when using either. Nevertheless, I admit to being a cloud and sky junkie. Okay, perhaps an addiction, too, to trees, spring wildflowers, thunderstorms, frosty mornings… all things Nature! So, back to McDowell’s sky. Lots of rain the day and night before my visit had transitioned briefly in the wee hours to snow as cold air advected on the system’s back side. Hence, these frosted-sweetgum (Liquidambar styraciflua) stars… firmament falling to terra firma! 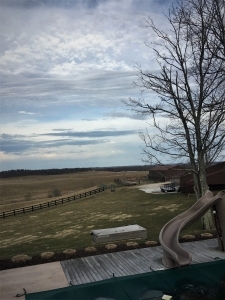 As the vigorous low pressure system departed, northwesterly winds and scudding stratocumulus gave us a classic fall sky. I expected to see a skein of geese at any moment. If only during our deep summer I could conjure a few days of blessed heat-relief… this is how those days would look. McDowell meets some its electrical needs from solar photovoltaic. Even with the morning’s dark overcast, old sol manages to generate some current. By mid-afternoon, the sky cleared. 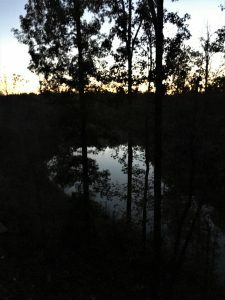 I snapped the two dusk shots from my west-facing deck, looking across the pond above with the canoe. From that perspective, my cabin is the one at center-top. I like the framed reflection of the waning firmament in the pond’s now-still surface. Given frontal passage, clear skies, and calm winds, I knew the next morning would dawn crisp and frosty. As is my usual habit, I awoke well before dawn. This early shot shows crepuscular rays streaming from the rising sun, still below the horizon. As I’ve often pondered, what TV program, video game, or web-surfing late at night could possibly be so good as to beat the rewards of dawn? Henry David Thoreau (Walden) likewise loved day’s dawning, “The morning, which is the most memorable season of the day, is the awakening hour. Then there is least somnolence in us; and for an hour, at least, some part of us awakes which slumbers all the rest of the day and night.” Imagine the price some pay for late evening TV, gaming, and surfing — to never experience the awakening Nature offers. And a few minutes later, the sun, with lots of work to do on a very cold and frosty morning, kissed the grass. Again, words do little but distract from the gift Nature presents to those willing to seek and embrace the beauty, magic, wonder, and awe. 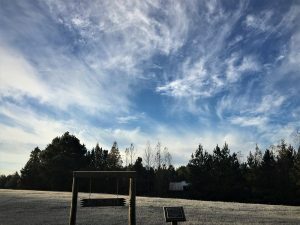 The ground still frosted, I could look outward (from my terra firma perch) 3-6 miles and negative 15-25 degrees Fahrenheit to an etching of white cirrus against the purest of blues. Cirrus is a genus of atmospheric cloud generally characterized by thin, wispy strands, giving the type its name from the Latin word cirrus, meaning a ringlet or curling lock of hair. The strands of cloud sometimes appear in tufts of a distinctive form referred to by the common name of mares’ tails. Pity the impoverished soul who could not feel inspiration in such an image… and sense absolute humility in the wonder of Nature. The remnant cirrus from the prior day’s system drifted eastward during the morning, yielding to mostly clear, high blue skies, this view from the south end of a pond north of the Camp proper. 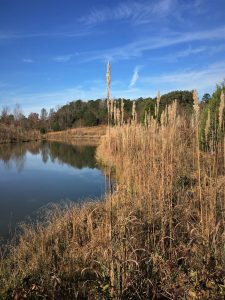 This is prototypical Alabama winter: freeze-deadened herbaceous, leafless hardwood, loblolly pine green, open water, and azure-blue sky. Another view worthy of rejoicing. Mid-morning along the creek as the cirrus drifted to the east. As I have said many times, my aesthetic appreciation leans toward paintings that look like photographs… and to photographs that could be paintings. Could anyone command a brush to match or exceed the beauty Nature provided my simple iPhone?! As I departed McDowell and shortly thereafter passed the Bankhead National Forest, the sky could not have been more cooperative. 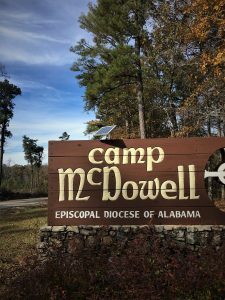 I’ll be back at McDowell several times over the next 3-4 months gathering information, images, and a deeper understanding and appreciation for the Camp and Conference Center. 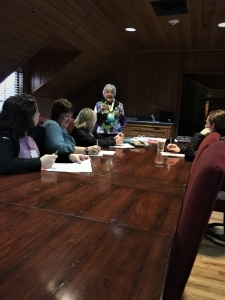 Our goal it to develop McDowell’s Land Legacy Story as a reference and tool in support of McDowell’s mission, which for the Environmental Center is: To connect people to their environment, teach respect for the Earth and its beings, and to promote a commitment to lifelong learning. I can only hope that the firmament above these blessed acres will reward me anew with special magic. Yet as in all things Nature, my threshold for absolute awe and amazement is low. I’m an easy target… for I see wonderment in what too many others view as mundane, if not unpleasant or invisible. Look up — literally and metaphorically — Nature’s beauty, magic, wonder, and awe abound… and the composite surrounds us. Learn more — understanding deepens and expands appreciation and wonderment. 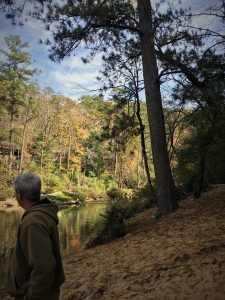 The property sits smack dab in the midst of the Bankhead National Forest’s 181,000 acres. I’m astounded that these 283 square miles of exquisite forestland came to the Forest Service under the movement 125 years ago to deal with and manage the huge swaths of abandoned and spent eastern forestland (as well as abandoned farms) referred to broadly as the lands nobody wanted. 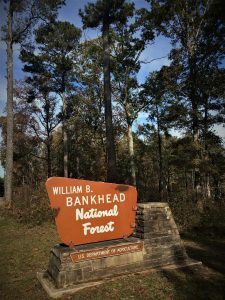 I drove through miles of the Bankhead as I headed south to McDowell. I’m a softy for unbroken forest. 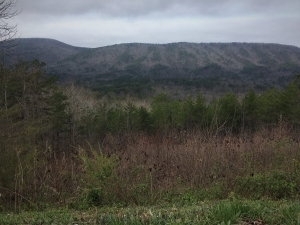 Only someone as I, familiar with the eastern National Forests and their history, along with my perception of the roadside forest as even-aged, second-growth, would see this unbroken cover as anything but forest primeval. Some might say, “How boring; there is nothing to see!” Au contraire, this was heaven to my appreciative professional forester’s eyes! 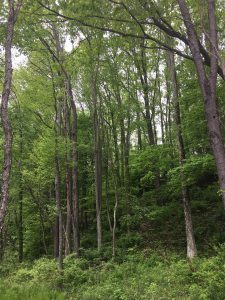 Rolling hills of mature pine and mixed hardwood forest… some thinned, some periodically burned to control understory vegetation. The Camp McDowell entrance sign appeared as I was still appreciating and admiring the forests. I’ve visited McDowell a half-dozen times over the past couple of years, first as guest of then McDowell Director Mark Johnston and Environmental Education Center Director Maggie Johnston. 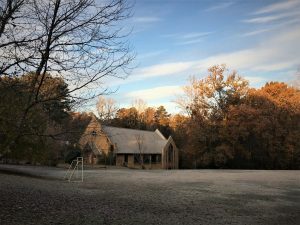 The St. Francis Chapel is emblematic of the Camp’s devotion to Faith, Nature, and the future. What better lens to view the Chapel than the dawn’s first rays of sun on a frosty mid-November morning. McDowell greeted my Thursday morning arrival with a dusting of snow and 30-degree temperature. I stayed overnight this most recent time at the far lodge above Sloan Lake (lower left photo). A perfect setting to appreciate the Camp. The day remained cloudy, breezy, and unseasonably cold, never reaching 40. The average daily high for the date is low 60s. I have not confirmed that we set a record low high temperature for the date; I am sure we at least approached a new record. Lakes, streams, and falling leaves don’t mind the early cold. People complain a bit. 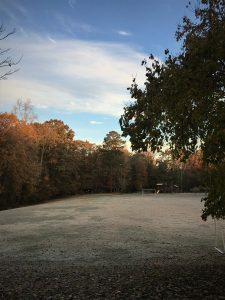 After an uncommonly warm September and October, I saw the chill as overdue, and found joy in the November look and feel of the day. McDowell tugs at my heart. 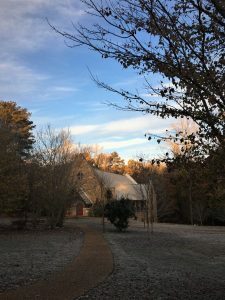 When in this extraordinary Natural setting, I engage with the place, its mission, its staff, the campers, and spirituality with all five of my life-portals: mind, body, heart, soul, and spirit. The whole is so much greater than the sum of its parts. McDowell reignites some fundamental tenets and principles that guide my life and profession. I want to make some small corner of this world better through wisdom, knowledge, and hard work. Perhaps McDowell is one element of that small corner I can influence. 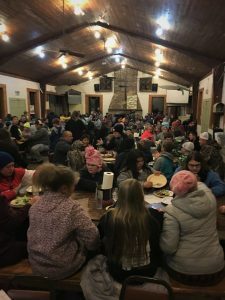 The Eppes Dining Hall at the Environmental Camp along Clear Creek fed some 200 fifth and sixth graders (and their teachers/chaperones) Thursday evening. 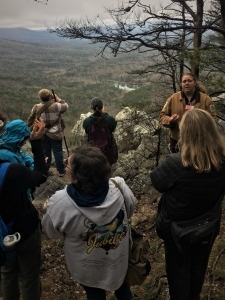 Participants are fully engaged and totally immersed in Nature’s wonders. I saw lots of places in the Camp core for relaxing and reflecting. Each special location has its story — memories, donors, and wisps of history and meaning. Even as these infrastructure elements tell a tale, the surrounding wildness and Nature have legacy components awaiting exploration, interpretation, and translation… leading to developing McDowell’s comprehensive Land Legacy Story. I would welcome a chance to memorialize McDowell’s Story. 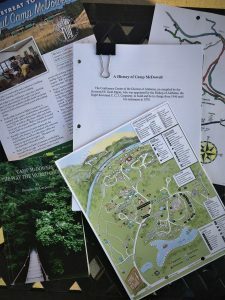 I want to help McDowell translate the record written in the land and forests, combine it with key interviews of current and past players, and add bits of history residing in available archives, including old photographs (aerial and land-based), and individual recollections. Oh, if only we could literally wander back in time. When would have been the ideal time to begin weaving the story? Perhaps 1847, one hundred years prior to McDowell’s formal on-site beginning. Or, if only the Clear Creek rock ledges could talk! Or the massive loblolly pine (flanked by former Camp Director Mark Johnston) along Clear Creek at Tiller’s Beach. This magnificent specimen (yes, the tree!) likely stood there in 1847 as a sapling. 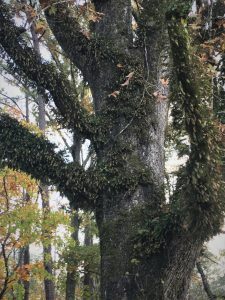 Or the resurrection fern-festooned oak that shaded the front yard of a long-since gone farm house or outbuilding along the Camp entrance road near the current Camp store. The oak certainly predates the Camp’s origins and may have been planted in the late 19th century. I wonder when the first fern sprouted from the now deeply-furrowed bark. Think about how appropriate it would have been if the first floral resurrection occurred in 1947! 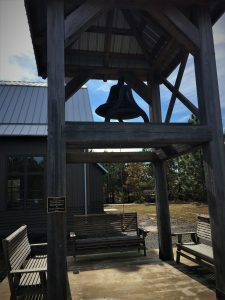 In effect, its sprouting could symbolize “the way the world could be through worship, learning, rest and play in the beauty of God’s Backyard.” Here was Camp McDowell rising from an old worn out farm in the midst of 283 square miles of the lands nobody wanted! We can core the oak with an increment borer to determine the tree’s age. Dating the fern’s appearance will take the luck of a chance photo from the Camp’s early days. If only we had begun detailed chronicling of McDowell’s natural components in 1947. Yet we really cannot begin such deliberate and detailed monitoring and record keeping until now. And begin we must. Who among future campers in 2118, 100 hundred years hence, wouldn’t enjoy seeing the Camp’s first solar photo-voltaic panels? A literal example of “Harnessing Nature’s Power”! 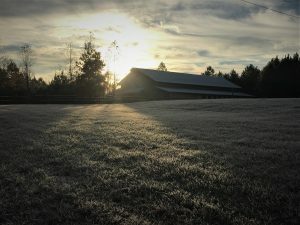 Who would not appreciate seeing the November 17, 2018 sun rising from behind the barn, illuminating a frosted field? 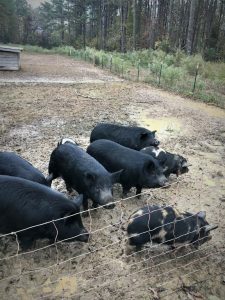 Or seeing the Farm School pigs relishing the mud within their enclosure? Imagine a permanent photo point capturing this view to the north from the embankment along the beaver pond dam? A snap shot repeated routinely every ten years demonstrating changes the 2118 fifth grader can observe back through time. What might a permanent ten-year-interval photographic record reveal from Tiller’s Beach? Here are Friday’s view upstream (left) and downstream (with former Camp Director Mark Johnston contemplating the view and reflecting on his five decade love affair with McDowell, beginning with student seasonal engagement). Mark is among those who can fill voids and inform the Land Legacy Story. There are others (in addition to Mark) we must transport virtually via the Legacy Tale to 2118 and beyond. If only I could bottle the elixir-essence of our November 2018 morning stroll along Clear Creek. How many tree and shrub species does McDowell host? No one I asked in mid-November knew the answer or could recall seeing a species inventory. I’m hoping that over the Camp’s 71 years some intrepid botanist has assembled such a list. Legacy Story research will entail scrubbing the archives to rediscover such a list. If one does not exist, developing the inventory will fall to my Land Legacy Story recommendations section. 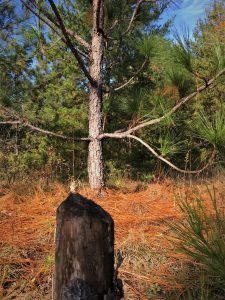 Longleaf pine is one of my favorite Alabama trees. It’s one of the state’s ten native pines. How many others of those ten are on-site? 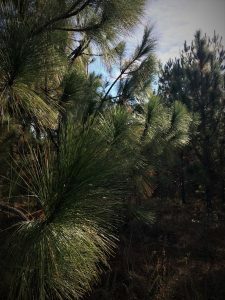 I saw loblolly, Virginia, and shortleaf pines as Mark and I hiked several trails Friday morning. Mark and associates planted hundreds (thousands?) of longleaf seedlings on cleared land surrounding the beaver pond and at other locations on the property. I was surprised to see direct evidence that the intrepid pond rodents harvested the sticky sap-rich saplings (chewed-off stump in foreground lower left). Easy to see how longleaf earned its moniker (standing tree lower left and the dense foliage lower right). That’s Mark’s hand (for scale) on a Tiller’s Beach farkleberry (Vaccinium arboreum). Another common name: sparkleberry. It’s the only tree-form member of the blueberry genus. Its deep black fruit shines and sparkles this time of year; the term farkle implies a combination of sparkle and function. According to The Flora of North America, “Sparkleberry grows on sand dunes, hammocks, dry hillsides, meadows, and in rocky woods. It also grows on a variety of moist sites such as wet bottomlands and along creek banks.” This specimen occupies a sand bar site moistened from within the sandy soil by Clear Creek seepage. According to the Missouri Botanical Garden, bigleaf magnolia (Magnolia macrophylla) “is noted for its huge oblong-obovate leaves (to 30 inches long) which are the largest simple leaves of any tree indigenous to North America. Leaves are green above and silvery-gray below. 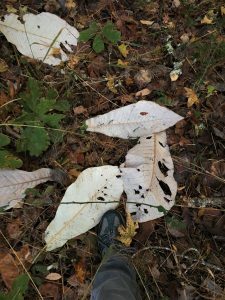 This unusual tree is rarely found in the wild, being limited mainly to a few rich wooded areas in river valleys and ravines in the southeastern United States.” Carolina Nature describes bigleaf magnolia as a “rare deciduous native.” I saw nothing rare about bigleaf magnolia at McDowell. I’ve never seen such abundance in my travels across its range. By the time I departed Friday afternoon, most leaves had fallen. Thursday morning some trees still held fast to their yellowing leaves (lower left). My boot (size 12!) gives some sense of leaf scale. Oddly, nearly all leaves fell top-side down. A mystery for another day. A future assignment for Environmental Camp sixth-graders? 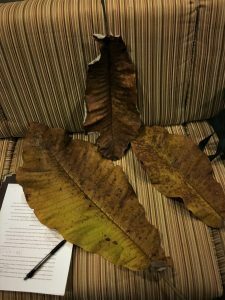 I couldn’t get over the impressive leaf size — the longest on the sofa below is 26-inches! 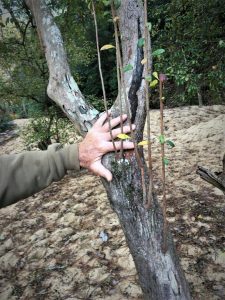 So, on-site during those two days, we discovered individuals of the only tree-form blueberry (genus Vaccinium), North America’s longest-leafed indigenous tree species, and one of Alabama’s largest loblolly pines (record is ~4.5-feet diameter). McDowell’s Story begs to be told! 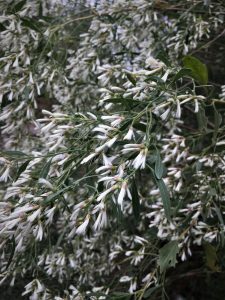 We encountered a willowlike-leaf shrub in what I at first surmised was in full flower along roads and field edges. No one I asked could identify it. When I originally posted this essay November 27, I noted, “I am still investigating. I suspect it is an invasive. Because it is so common and spectacularly showy for the season, it is worthy of a mid-November floral highlight for one of the state’s premier environmental education centers. 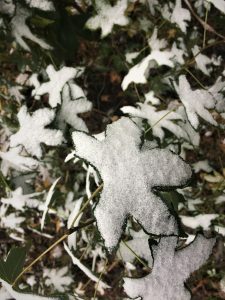 Just another component of the Camp’s Land Legacy Story, which is both a look back… and a careful and deliberate view ahead identifying needs critical to Camp relevance and excellence.” Today, December 5, 2018, with the help of Cane Creek Canyon’s Jim Lacefield, we have identified the shrub as groundsel-tree (Baccharis halimifolia). How on earth did I not properly identify this species that is native to North America from Massachusetts south to Florida and Texas!? I admit total embarrassment. Once Jim led me to identification, I revisited my photographs. What I mistook (sloppily) as flowers were in fact seed heads, the silky seed appearing to my lazy examination as flowers. A big wake-up lesson for me — I sat for far too long in my higher education executive offices, growing dull in my field skills. I pledge to be more diligent, systematic, and persistent — to pay attention to field tools lost to pencil-pushing! Now, what about the non-tree and shrub flowering plants — a McDowell inventory? My favorite paintings look like photographs (Yes, I am a man of simple tastes); my favorite photos look like paintings. Nature’s frosty brush painted the Friday morning image below. 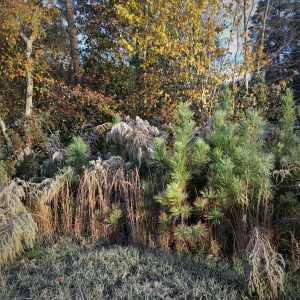 Sedges and goldenrod, frosted pine seedlings, and foreground frost-silvered grass with mixed fall hardwoods providing background. A nice painting! I’m a sucker for bark encrusted with non-flowering plants. 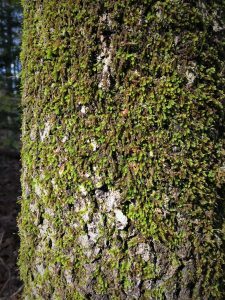 An admirable moss community coats the Virginia pine stem (lower left); lichen adds a nice pattern to the otherwise slate grey of the American beech near the lodge where I stayed. Nature tolerates no vacuums in these well-watered southern temperate forests. Do the Camp archives contain inventories of McDowell non-flowering plants — ferns, mosses, lichens, fungi? Even something as simple as a weathered fence rail can inspire. 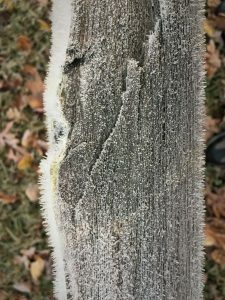 Soaking rain, transitioning to snow before ending Thursday dawn, had saturated the wood. 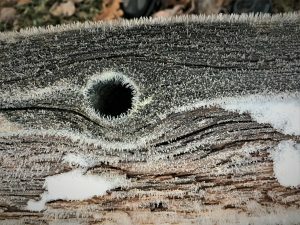 Friday morning’s 24 degrees drew frost-sickles from the wood… a hoar frost decoration. Add in remnant snow around the old knothole, and the adornment is complete (lower right). Nature’s beauty, magic, wonder, and awe are wherever we choose to seek and discover. The rewards are ours! 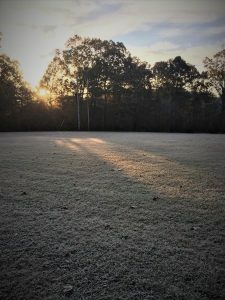 A frosty field and a leaf-strewn woods path at dawn soothe the soul and elevate the spirit. McDowell’s Nature portfolio begins fresh with every new day. 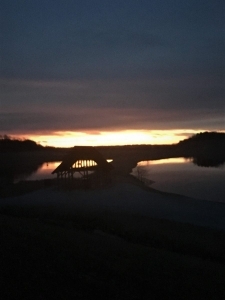 This dawn photo epitomizes the spirit, promise, and hope of a new day in God’s Backyard. And, again, the Chapel symbolizes “the way the world could be through worship, learning, rest and play” in Nature. Even if my mid-November McDowell visit does not lead to preparing the Camp and Conference Center’s Land Legacy Story, I will have lived richly in McDowell’s inspired glow for two days. Whether I compile the Story or not, the tale will remain within the land. Every parcel has a Story. 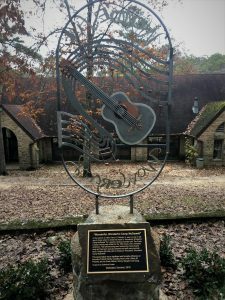 Camp McDowell has touched and changed lives for seven decades… thousands of lives. Its Land Legacy Story is all the more powerful owing to the Camp’s mission and cause in service to humanity. If asked to proceed, I would accept the challenge with great humility, and a heartfelt gratitude for a chance to make a positive difference for tomorrow. I would seek inspiration from the mission, the land, and the people who lead (and led) the way. What an honor and privilege it would be. My efforts would be purpose-driven and passion-fueled. I believe in the noble cause that guides McDowell. Although these are my five verbs, I see them implied in all that McDowell does. The Environmental Center mission “is to connect people to the environment, teach respect for the Earth and its beings, and to promote a commitment to lifelong learning.” I watched the Camp in action in form of a Thursday evening Radical Raptors program at the Chapel. I did not need to reach far to witness my five verbs in practice. 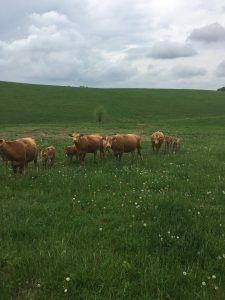 Colleagues Craig Cassarino and Dr. Jean Meade and I visited an east-central Ohio cattle operation owned by friends and associates whom Craig has known for two decades. 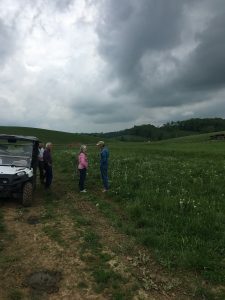 Because we three are collaborating on a Nature-based, sustainable agriculture-themed education project near Morgantown, West Virginia (Jean’s location), Craig wanted Jean and me to see the property and meet the landowners. Craig flew into Pittsburgh (90 minutes to Morgantown) from New Hampshire to coincide with my travels to the area. We drove over to Flushing, Ohio first thing Thursday, May 17. At this stage I will not reveal the owners’ identity. I want to coordinate telling their incredible Land Legacy Story more fully with them. Theirs is a story meriting recognition and celebration. 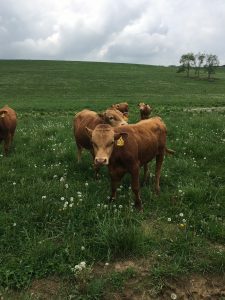 Premium Japanese cattle breeds are among Craig’s many interests. He is the catalyst (shall we say “cattle-yst”?) 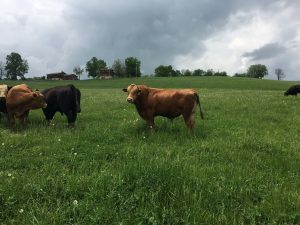 responsible for this operation incorporating Akaushi, what one web site called one of “the most outrageously marbled, incredibly decadent beef on the planet.” The cinnamon-brown bulls below are Akaushi. The operation’s other bull breed is a more common black Simmental, bred on this operation with Black Angus heifers. 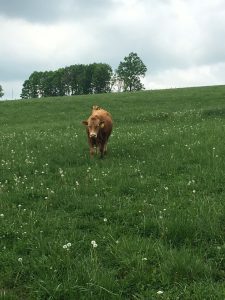 A Simmental bull grazes beyond the Akaushi in this photo. The family’s home sits atop the hill. A sight (and site) of pastoral splendor, accented and back-dropped by the rising cumulus. The owners did more than the expedient and minimally expensive to meet the letter of reclamation laws. They acted consciously and deliberately as Earth stewards. Their responsible actions created a landscape of pastoral beauty and productivity. The 16-acre impoundment below supports fish, frogs, and turtles and attracts diverse mammals and birds. I took the photo from the patio of the family’s cabin. A 50-70-foot-high spoils ridge stands behind the cabin (below left). A clear-water spring exits from the hill (below right) from a point near where I stood to take the photo of the back of the cabin and forest. The naturally-regenerated hardwood forest would appear as growing upon undisturbed land to the uninitiated. Yet this stand regenerated on unconsolidated, piled over-burden from stripping. 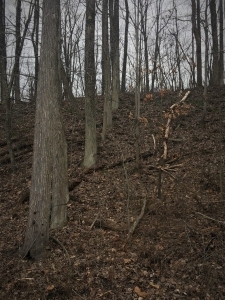 That debris ridge stood already re-foresting when the company rehabilitated the surrounding stripped acreage in 1983. The rolling pastureland where the cattle stand below supports lush forage. Interestingly, native, undisturbed pastureland requires liming to support grass and forbs of this quality. The reclaimed strip-lands include limestone debris, keeping the pH high enough to obviate the need for lime application. No obvious scars upon the land evident in the scene below, where ten Akaushi momma cows and their two-month-old calves came to greet us when we approached on the Polaris ATV. Same for the two views below. The owners care deeply about the land… and it shows. 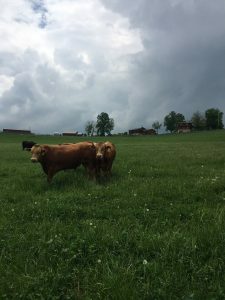 The owners prescriptively manage grazing to ensure healthy forage and cattle. Although I did not probe or shovel beneath the surface, I saw evidence that the site is developing true soil with deep roots and organic matter incorporation. If the landowners agree to composing a Land Legacy Story, I will bring along my soil probe and put my doctoral expertise in forest soils to work. As I write this post, Kilauea volcano in Hawaii is spewing lava… lava that will soon serve as raw material for rich soil as weathering (chemical, physical, and biological) acts upon it. Fact is, all of Hawaii’s land is of volcanic origin. The entire island system and its rich life resulted from severe disturbance. I recall standing at Exit Glacier near Seward, Alaska, reading the interpretive signage chronicling the glacier’s retreat over the past 50 years. Near the current ice front, raw terminal moraines of unconsolidated glacial till stand tens of feet high. At the sign marking the front five years ago, vegetation covers the deposits. By ten years ago, tree seedlings and saplings dominate. Where the glacier face stood twenty years prior, a young forest occupies the site. Nature knows disturbance. Nature pays little heed to whether the cause is human-derived or of her own work. However, we can assist Nature’s healing and abet her amelioration processes. 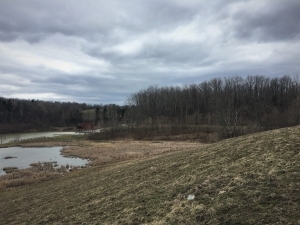 The Flushing, Ohio landowners returned the land to a near-natural contour. They accommodated drainage and surface water flow to resemble patterns common to this region. 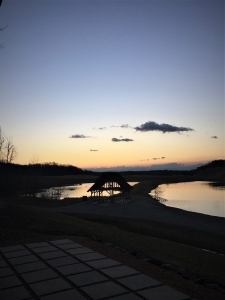 The company had stock-piled surface soils and reapplied them to the reclaimed landscape. They re-vegetated quickly and encouraged its growth and establishment. They are conscious of soil formation as a necessary requisite to full and long-term land health and its economic vitality. Land ownership comes with costs (e.g., taxes; access maintenance; protection from fire and trespass; fences); the owners seek a return on their continuing investment of time and resources. 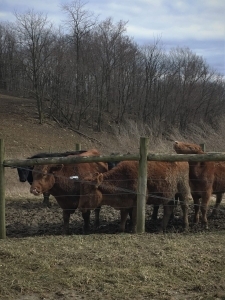 They seek an economically viable premium breed cattle operation. They realize that the more responsibly they steward the land, the more viable their operation. They believe in Earth Stewardship… because it’s the right thing to do and it’s doing things right. 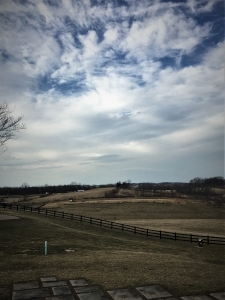 As we drove back to Morgantown, we observed many pastures on hillsides that have never been stripped for coal. We saw far too many hillsides bearing the distinctive scars of over-grazing. Corduroy contours of cattle walkways; bare ground where the grasses and forbs no longer constitute a soil-protecting stand; resultant erosion gullies; failed stream banks. Good land practices follow simple and proven treatment sequences and actions. Excellent stewardship can yield exemplary results on land that some would describe as having been decimated, destroyed, ruined by strip-mining. 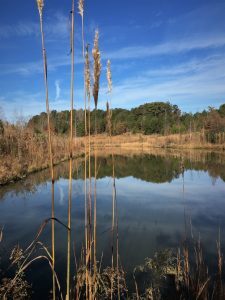 We saw first-hand in Flushing that good stewardship can return such abused land to full (and perhaps better than pre-disturbance) productivity — restoring its beauty, magic, wonder, and awe. 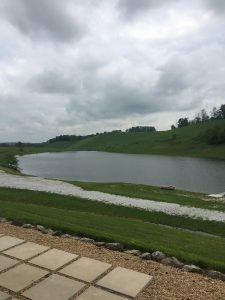 In contrast, as we returned to West Virginia, we witnessed that irresponsible treatment of undisturbed land can be a travesty of abuse, devastation, destruction, and ruination without a single bulldozer scarring the land. I will draw this essay to a conclusion by offering four relevant quotes from a conservation and land ethic giant, Aldo Leopold. Leopold wrote in A Sand County Almanac: “All conservation of wildness is self-defeating, for to cherish we must see and fondle, and when enough have seen and fondled, there is no wilderness left to cherish.” The landowners, my colleagues, and I certainly do not view the property as wilderness yet we do see it as a landscape blend of domesticated and wild. The fish, amphibians, and reptiles within the ponds do not care that their habitat is an artificial impoundment. The critters living within and near the debris-hill forest pay little heed to its origins. Leopold also wrote that “We abuse land because we see it as a commodity belonging to us. 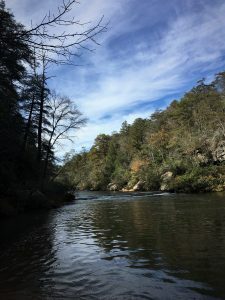 When we see land as a community to which we belong, we may begin to use it with love and respect.” The landowners may not have referred to their operation as a community. However, they spoke of it in such reverent and respectful terms that they conveyed the same sentiment Leopold expressed. They view the land, their home, and the cattle enterprise as fully integrated… and they see themselves as one with it. I observed earlier that the landowners reached beyond the expedient in rehabilitating the land. Leopold counseled all of us, with respect to caring for the land and its denizens, “Examine each question in terms of what is ethically and aesthetically right, as well as what is economically expedient. A thing is right when it tends to preserve the integrity, stability, and beauty of the biotic community. 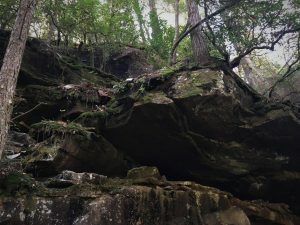 It is wrong when it tends otherwise.” Leopold expressed these thoughts nearly 70 years ago; the Ohio land stewards have been walking the talk for at least 35 years. They have and are doing the right thing. Even as I quote Leopold, he had his own favorite quote: “My favorite quote: The land ethic simply enlarges the boundaries of the community to include soils, waters, plants, and animals, or collectively: the land… In short, a land ethic changes the role of Homo sapiens from conqueror of the land-community to plain member and citizen of it. 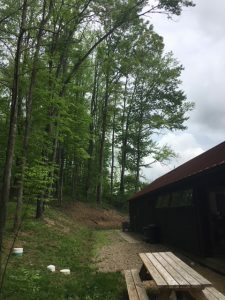 It implies respect for his fellow-members, and also respect for the community as such.” May 17, we visited a property cared for by landowners who are clearly citizens of the domain they have the privilege of tending. 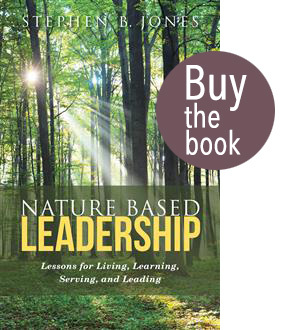 My Premise and Core Belief: Every lesson for living, learning, serving, and leading is either written indelibly in or is powerfully inspired by Nature! The Times West Virginian, Fairmont’s daily newspaper, carried a full-banner, top-of-page article October 14, “MCPARC hopes to develop East Side property.” MCPARC is Marion County Parks and Recreation Commission. Rather than rehash the full newspaper tale, I will hit THE Highlight. Recently (we can’t determine exactly when), a rainbow’s end paused along the Monongahela River, east side, within the city limits, adjacent to May Brothers Co on Wabash Street. How do we know? It left a pot of gold! 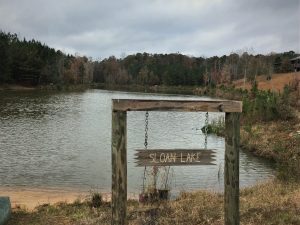 Forty-six acres of green gold – acreage that Marion County has owned for some time, but that time (and memories of former city officials) had forgotten. Because at heart I am a forester/applied ecologist (I just stumbled into higher education administration), Fairmont, WV community leaders invited me to tour the property and help envision its future. I also viewed that future through my Fairmont State University (FSU) interim president lens. We began with discussion indoors at the MCPARC offices. From there, several of us convoyed to the property. We parked at an old concrete materials-handling pad. The May Brothers buildings, built solidly a century ago, still stoutly anchor the site and the current operations. The buildings, in fact, are senior to the adjacent forest trees. We quickly exited our vehicles, descending a jeep trail into the forest. What did I see, beginning with the indoor session? 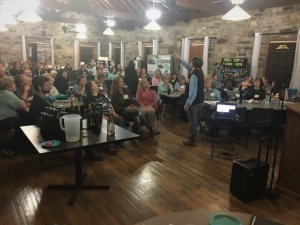 First, overwhelming energy and enthusiasm by MCPARC’s John Provins, May Brothers’ Mike Staud and Ronnie Nichols (the proprietors), Main Street Fairmont’s Nikki Lewis, and Northern West Virginia Brownfields’ redevelopment specialist Kate Greene. I saw an emerging dream, one with vision, determination, and a dedication to action. Without those three elements, a dream is merely a fantasy. I saw possibility leaning toward probability. I saw yet another opportunity for FSU to engage reciprocally with business, government, and citizens to ensure a brighter future. Feeling as though I was playing hooky from Hardway Hall (FSU’s “Old Main”), I spent several hours of an August-like afternoon wandering (and wondering) through a remarkably diverse parcel along the river, and transected by a feeder stream falling from alongside May Brothers. 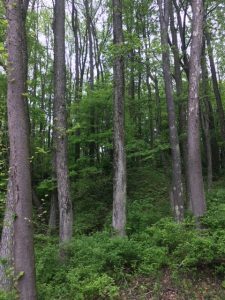 I have held for many years that every forested property has a legacy story… a natural and human history. The remnant infrastructure reminded me of the WWII bunkers, armaments, barriers, and hillside roads remaining on Dutch Harbor, mid-arc on the Aleutians. Recall that the Japanese had occupied a couple of the west-end islands, recaptured with great expense and considerable casualties (1,000 American dead; 2,000 Japanese). Whether military act or industrial development, we leave our mark. This newly re-discovered (rainbow enabled!) Marion County property (I’ll dub it the Fairmont/Marion County Arboretum (FMCA)) has a deep legacy story. Our too-brief trek served as a teaser, hinting at the possibilities and evidencing the rich past. Two railroads intersected. Long-span trestles bridged the hilly topography, one actually passing under the other. Railroads competed back then. History left palpable traces — no, much more significant than mere traces! The old concrete trestle abutments, disassembled bridge beams, abandoned rail-bed ties still in-place, and even a lovely brick pump-house riverside. All speak to the rich human history. 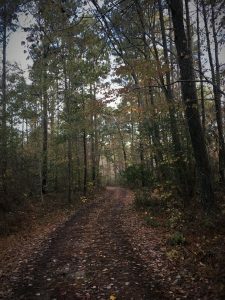 As do the woods paths, dirt/gravel roads, and actual rail beds that as hiking trails will offer easy access to the entire FMCA. The land legacy story should be told. I’d like to write it. I want to examine old aerial photos that may trace the past 70 years. Photos that will confirm (or challenge) what I might interpret from the land and the current forest. My assumption is that photo coverage will easily reach back to a time when the trains still ran, when the May Brothers site took root, and when the hills supported little forest cover. The rugged terrain, which extends from ridge top to river flood plain, provides for a wide range of soils and site productivity. 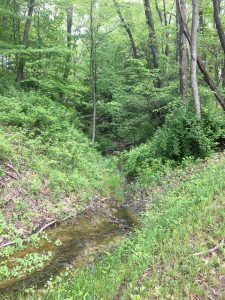 Human influences from industrial activity, to road and RR construction and maintenance, to fuel-wood harvesting and occasional fire, have created a diverse forest… one rich with species and serving as a great base for the FMCA. I tallied nearly thirty tree species on our short hike. 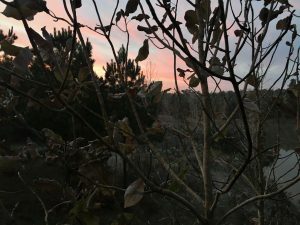 We all felt a sense of wilderness, although the tract is far from being “untrammeled by man.” I saw a few non-native species, most-likely naturalized citizens of this riverside plant community. I envisioned a systematic species inventory, perhaps by a botany graduate student. Mike and Ronnie would like to re-purpose their buildings — senior-level or master’s project fodder for our architecture majors. I’d like to see low-altitude, drone photos of the FMCA. Another student project. Opportunities for learning and research are unlimited. 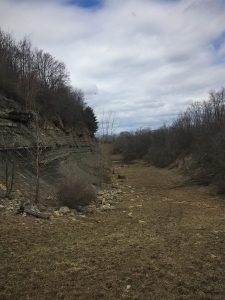 The old railroad beds along this east side of the river stand as one of the unconnected links in a 1,400-mile Rail-to-Trail network. John told us that from one of the bluffs, downtown Fairmont is clearly visible, and surprisingly close. The rails to trail connecting from Prickett’s Fort to Palatine Park transects the FMCA. Ultimately, many thousands of hikers/bikers will visit the Arboretum annually. The FMCA will be one more pearl on a necklace that will make Fairmont and Marion County soar and prosper. Our Fighting Falcon students will bike from campus to FMCA. In fact, we will attract students who otherwise would enroll elsewhere. Same for workers, businesses, residents, and retirees. One of my FSU Presidential frustrations is that when I bemoan some element or other of FSU’s current situation (e.g., we have one of the lowest percentage out of state students among our peers), I hear reasons (excuses?) for why that is the case. Instead, I want ideas, dreams, innovations, and actions that will inspire and lift us. The same holds for Fairmont and Marion County. Don’t tell me why Fairmont/Marion County doesn’t have nor ever will have an Arboretum. Instead, dream with John, Mike, Ronnie, Nikki, and Kate – make it happen. Invite me back for the ribbon cutting! I ended my Times West Virginian column with those words. Unfortunately, such contentment-sentiment can infect and stifle innovation and creativity, whether a university, NGO, governmental agency, or business. Once again, Nature offers some sage wisdom and common sense. Recall the tried and true folklore wisdom that only the turtle willing to extend his neck makes progress. Poor old Rip Van Winkle — the world swept past for twenty years as he slept. Remember the story of the ant and the grasshopper. So many North-central West Virginia communities have slumbered. Jobs and workers have out-migrated. Yet this is a region with abundant natural and aesthetic resources. The group I accompanied is following the advice I have oft-repeated in these Great Blue Heron posts. We must Look, See, Feel, and Act. My role is to help them see more clearly what lies before them. To deepen their appreciation and sharpen their inspiration. They are ready to act. I am ready to assist by directing them to expertise and to those who might share their mission and accelerate their action. And I can tell the tale that connects the land’s past to a truly vibrant future… one rooted in a commitment to Earth stewardship, conservation, and responsibility to the future. 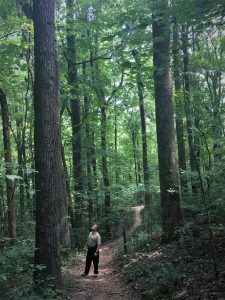 The Fairmont/Marion County Arboretum must be linked to the past, and anchored to Nature-Inspired Learning and Leading. For generations hence, today’s Land Legacy Tale will be extending one day, one year, one decade at a time… and beyond. The FMCA team members are ready to apply the power of their beliefs to the service of translating dream to reality. They are harnessing the power and passion of Nature. Heart, brains, and courage — they have what it takes!